Families everywhere have already enjoyed Pancake Day, also known as Shrove Tuesday. It’s the first of several traditions which continue right up until Easter Day. Read more about how families can join in these special events. Pancake Day, Lent and Holy Week are all part of the journey to Easter Day, the biggest Christian celebration of the year. It is a time when lots of people make time to think carefully about their life. For Christians, this means trying to live God’s way and remembering all that Jesus did. Pancake Day is also called Shrove Tuesday and is one last chance for a big party before Lent begins with Ash Wednesday the next day. Long ago, Christians traditionally used up all the eggs and fat they had in store by making pancakes and feasting on them. This was because when Lent came, they would eat less food, or even fast (do without food sometimes) to help them focus on God and not on the things they wanted. This tradition has been passed down the generations. Shrove Tuesday always falls 47 days before Easter, a date which changes every year. In 2018, it falls on February 13th, before Lent began on February 14th. With eggs, flour, milk and butter, anyone can join in with Pancake Day. You could even see if your local church is having a pancake party. Lent is a time of getting ready for Easter. When Jesus was just getting started with his work, he went into the desert for 40 days to be all alone with God. He even went without food and prayed, and was tempted away from what God wanted him to do in all kinds of ways, but he resisted that temptation. You can read that story here: Matthew 4:1-11. During Lent, Christians often do something different too, like praying every day or reading the Bible. This reminds us of Jesus’ time in the desert to focus just on God and feel closer to him. The good news is that Sundays are still celebration days – so you can take a break from fasting! Even young children can take part in Lent. 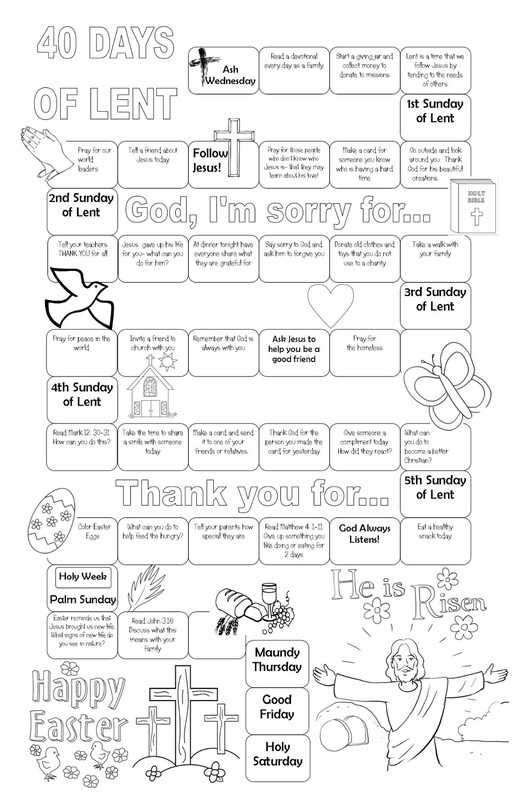 For example giving up a sweet treat every day might remind children that we can live more simply, or a calendar like this one offers Lent activities, prayer ideas, and Bible verses. Churches may look quite different during Lent. You might notice the colour purple, or there may be very few decorations or flowers. This is because it’s a time to concentrate on God and remember how Jesus gave up his life on a cross to save all of us. Because Lent is a time to reflect, church music and songs will tend to be more reflective and services won’t ever include the word ‘Alleluia’ – a very joyful word to express praise for God. It’s a big contrast when Easter Day arrives, when the colourful decorations come out, there’s lots of celebration, ‘Alleuias’ and joyful music! Why not go along to a church service in Lent and play a game of spot-the-difference – how is it different to other services you have been to? Then go at Easter and play again! Talk about how each service feels and why they have these different moods.